For FULL wwv frequency list "Click HERE"
In SSTV mode, click on the "options" tab, then a window will open, now click on "sound card calibration". Press NTP Client and make sure you have at least one valid time server selected. After five seconds the measured sample rate is shown. It will take at least 30 minutes for the displayed values to stabilise, the best solution is to leave the calibration running for a few hours or even better overnight. You will need to calibrate both TX and RX. Set receiver to 9.994.5Mhz USB, listen for the fastest ticking sounds, you may have to wait a while for RWM to start, be patient. Start DM780 SSTV, select - Options/Calibration and set the Rx sample rate to 8000.0000Hz, click OK.
Set SSTV to receive Scottie DX. After a while of receiving these ticking sounds, look closely at the resultant pattern, they may be slanted at this point. Using the manual slant correction buttons, correct the slant until you get vertical columns. 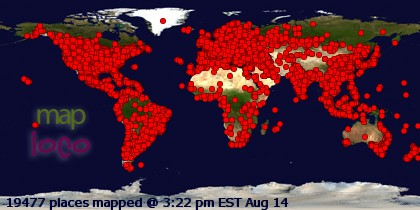 Make a note of the displayed frequency, see attachment, mines showing 7998.5352Hz. Now add the magic number 2.5 to that figure, thus 7998.5352 + 2.5 = 8001.0352 in my case. Go back to Options/Calibration and enter the resultant figure (8001.0352 in my case) to the Rx calibration window and click OK. In MixW slant correction can be done in very easy way: just "draw" a line along the slanted border and that slant goes away. But since there are many programs which can't repair the slant or the slant correction is not very easy, the calibration is highly recommended. RX calibration is very simple, and as the first step you may set TX correction value equal to RX correction value. Usually RX and TX sample rate corrections are equal, but what to do if they aren't? It is very easy to tune TX sample rate during a QSO with MixW2 on other side. Just ask for the value of the RX slant correction and substract it from your current TX correction value. On Windows 2000/XP we can run two copies of MixW using the same sound card. So, assuming both copies have RX calibrated by receiving WWV or any other process, we can use one copy to calibrate another: the second instance of MixW is playing a role of a remote station. Be sure, such process requires more computing power. Tune your radio to 15000 kHz or other clearly audible WWV frequency and Switch MixW to SSTV mode. 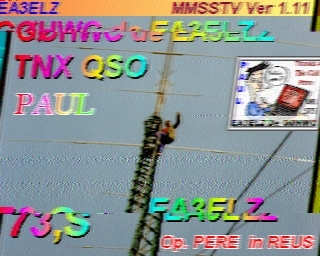 In the Mode window, select "WWV" At the top of the SSTV window, tap "RX". Soon, a vertical line will begin to appear in the SSTV window. Wait until you get an entire screen full of the vertical line. If your sound card receive is perfectly calibrated, this line will be perfectly vertical. If not, it will slant left or right. Use the slant keys to make the line vertical. Use the arrow keys to move the line closer to the screen edge. (It is much easier to correct the slant if you compare it to the vertical screen edge). 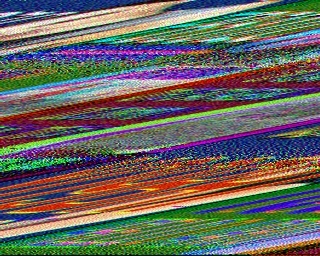 Once you have the line perfectly vertical, click "STOP" at the top of the SSTV window. Then click "MODE" at the top of the MixW window and then click "MODE SETTINGS". If you made slant corrections in the previous steps, you should see a number in the "RX slant correction" window. Click the "GO!" button and the correction will be sent to Sound card Settings as the permanent RX sample rate correction. If you feel you made an error and wish to start over, click "Configure", then "Sound card Settings". Change the number in the Clock adjustment, ppm: "RX" window to 0. Then start all over. Note: This test should only be done AFTER you have done a valid WWV slant test and entered the resulting RX clock adjustment in the MixW sound card settings. You should also do on-air testing of received MFSK images to confirm your RX clock adjustment before proceeding. Under Sound Device Settings, select "full duplex" box and check Sample Rate set to 11025. On sound card Input volume, change from LINE IN to WAVE. If WAVE control is not present, under Recording Control, select options/properties. In the properties window, place a check in the WAVE/MP3 box. Click OK. The WAVE/MP3 control should now be present and you can proceed with selecting it. Simultaneously press CNTL, SHIFT and T. A pop up window should appear. Note: It doesn't seem to matter if what numbers you have set in your TX and RX clock adjust when you do this test. The clock adjust in PPM (parts per million) is directly related to the Sample Rate according to the following formula: (1 divided by Sample Rate) x 1,000,000 = PPM per Hz Sample Rate. At the default sample rate of 11025, one Hz of sample rate is equal to 90.7 ppm of clock adjustment. Some people change their sample rate to correct for slant, but PPM allows much finer adjustment. 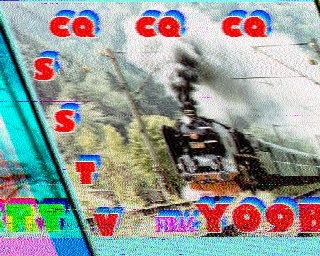 In SSTV, the discrimination of the clock appears as a slanted image. For MMSSTV, you are not required to have the absolute and exact clock frequency value (e.g. 11025Hz). But it is important to get MMSSTV informed on what the frequency of your soundcard has. In normal situations, you would only have to adjust the slant by using the Sync window. If you want to calibrate your soundcard very accurately, listen to the standard radio or fax wave. 1) Go Option, Setup, Misc page, and push Adj button. 2) Receive standard radio wave (e.g., WWV and JJY). 3) Tune into the tick sound. 4) Continue listening to the sound for a while. You have a vertical line. 5) Click the upper point of the line. 6) Click the lower point of the line. You could use FAX broadcasting instead of WWV or JJY, but be sure it has exact timing. Refer to the MMTTY help for details. If your soundcard seems to have different clock sampling frequencies for TX and RX, adjust the offset frequency with the following procedure. 1) Adjust the slant in RX. 2) Go Option, Setup, and TX page. Select External in the Loopback. 3) Connect the Line-out to the Line-in of your soundcard. 4) Transmit an image with Martin 1. 5) You should have an image through the external feedback. 7) Push the TX(TX offset) button in the sync page. 8) Make sure that you have no slant in the TX. If you still have slant, repeat from (6). It is a good idea to use the High-accuracy slant adjustment at Step 6. If you are not satisfied with the result, start it again. Never push the Mem button at this step. You can use the LoopBack function of a mixer program instead of using the external feedback line. Although this procedure can be applied only for the soundcard that supports the full-duplex mode, the soundcard that does not support the full-duplex mode should not have different frequencies for TX and RX, and therefore you do not need this calibration. If you have a report that your TX image is greatly slanted, try changing the soundcard modes, monaural or stereo (Source in the Misc window of Setup MMSSTV). Some soundcards seem to use different sampling frequencies for the full-duplex and no-full- duplex operations. In such a case, the offset calibration using the external loop back does not help. You should always have the loop back External or consult the QSO report. If the images you are TXing are chopped like these, this is not a slant problem. There are a few things that can cause this. While TXing you are running and using other applications or just doing something on your computer that interrupts CPU processes. You will get this more often if you are running a slow PC. These 2 picks are a problem at the TX end and not a RX end problem. Stuttering Sound Output "this causes chopping"
The stuttering is due to a conflict over system resources, and the most likely culprit is hardware acceleration of the graphics card: Especially on older systems, high acceleration settings may cause the graphics system to lock out all other processes, such as sound card operations, while the screen is being updated. Since Daqarta updates the screen repeatedly for real-time signal display, the sound stops briefly for each screen update. Move the Hardware Acceleration slider to the left. You will probably find that 'Basic Acceleration' (second mark from the left end) solves the problem, so try that first. You may have to restart your system for this to take effect, so be patient. If this fixes the sound problem, but you are unhappy with the graphics performance, you might want to try searching the internet for a newer driver for your graphics card. In order to enhance their rankings in reviews, some (especially older) graphics cards were released with drivers that gave absolute maximum performance on graphics benchmark tests, without regard for the consequences on the rest of the system. Updated drivers were later released that still gave good acceleration without shutting down everything else. Copyright 2007 by Interstellar Research www.daqarta.com Software for Windows Science with your Sound Card ! DAQARTA v4.51 turns your Windows sound card into a precision laboratory instrument, loaded with advanced features. Put your sound card to work! If you find any errors in any of the above, please let me know.